I wanted to start a thread about "farming" in a suburban/urban environment. I'd like to think I've learned a lot over the 10+ years I've been gardening in my backyard. But it seems I stumble across new information every year that can improve my yields. Things to discuss - types of plants - location - raised beds - fertilizer/organic - pest control - watering - weed control etc. I have a 10 foot by 100 foot garden and keep a path down the middle for easy harvesting. I ran hose to the area and run a drip irrigation system from it. About 15 feet of the entrance is a trellis that I run my cucumbers on. Usually by the end of the summer the cucumber vines totally enclose the trellis so it's a neat leafy tunnel. I generally don't fertilize. I compost and till that compost in every spring. I do fertilize my corn - but corn requires a lot of nitrogen - I found out after my first year with corn that adding the right nitrogen makes a huge difference. I also add high acid based fertilizer to my blueberries (and my rose bushes) to lower the Ph for them. I don't know of an alternate means at this point to lower the Ph. I usually don't have a pest problem. I had a problem with asian stink bugs a couple years - that i simply couldn't get rid of. So I stopped growing Squash and Zucchini for two years - enough to get out of their larval cycle. And they seem to have been mostly eradicated. Aphids will get to my green bean leaves but a decently cold winter has lowered their numbers this year. Corn will occasionally get a worm on top of a cob but you can trim that off without much worry. Tomato hornworms are my nemesis though. I hate them with a fiery passion. And they give me the creeps. I'd rather hold a snake than to come across one of these things. Last edited by trpmb6 on Mon Jun 25, 2018 6:59 pm UTC, edited 1 time in total. We just moved into our house about six months ago and finished some garden prep work recently. We took out all of the lawn and put in either local plants or ones that would require no water (after the first year). We also have a raised bed, it's not very big - maybe 3 feet by 7 feet or so? We put some veggies there, we'll see how they do... I would like to have more vegetables in the future, but we'll see how the plants we've already planted take hold. Denver soil is pretty bad for growing so I think you have to use a raised bed. At least, that's what I understood of this. Zohar wrote: Denver soil is pretty bad for growing so I think you have to use a raised bed. At least, that's what I understood of this. Raised beds have a lot of benefits other than just the good soil. You will reduce pests a large amount. Especially in the first few years since there will be no larva in the soil yet. They may show up eventually though if you don't do a good job of turning over the soil. There are also new watering system ideas if you put a lot of pre-planning into it. A friend of mine ran a drip irrigation inside his raised bed before putting all the soil in. It has the added benefit of no evaporation and getting water directly to the roots. Raised beds can also help if you need to keep a well drained soil for different plants. Too much water can be a bad thing sometimes. On another topic. I can't decide what to mulch with. I've found straw is really convenient. (We like to decorate our house in the fall with straw bales from a local farmer after wheat harvest) The added benefit is that I take those bales out to the garden after thanksgiving. Down side is if you till that into the ground you're likely to get some orphan wheat growing. This year I threw down some cheap mulch. I'm already regretting it. It's going to be a mess to clean up and I don't think tilling it into the ground will be an option. But if I get two years out of it that might be better than doing straw each year. Jury is out. That's a pretty good mix for a 10x7 garden. I used to do rather a lot of gardening, but I've slacked recently. One challenge is that some of the soil in the area is high in lead, because MD is awful, so I generally do something over and above dropping plants in the ground*, be it growing from pots, a raised bed, and my latest attempt, an automated interior grow-pod. The latter seemed really cool, and worked great for a few months. Unfortunately, the ants are extremely persistent every summer, and they somehow always manage to find the GD thing. Even when it's at the top floor of the townhouse. Dunno, maybe it's the plant growth mix or what not, they can probably smell that. Anyways, when they find it, they dogpile in, and the impeller eats itself on them. So, I'm again at the stage of dead plants and needing an impeller, and not having bothered to fix it. One day, maybe. It seems like it'd be great, if I could just get past that, but this ol' house has way, way too many holes to make ant-proof. I did also pick up a few acres of less-urban land, so I might do some fruit tree planting there soon enough. Haven't completed a plan for what I'm doing with that, but I've always been fond of the idea of having a lot of fruit trees around. *I'm aware that most plants don't actually uptake a whole lot of lead, but it's an area I prefer to be extremely cautious with. *I have battled with what types of tomatoes and peppers work here, and have come to the conclusion that any tomato larger than a smallish plum tomato just isn't going to work. I now plant a plum tomato and a cherry tomato, of varying varities. Peppers I have found an heirloom Italian sweet pepper called "Corno de Toro" which does great, which I have been keeping a seedline alive of. I've come to a similar conclusion about tomatoes. Gone are the days of when I'd go out to my Dad's garden and pick a giant tomato the size of a slowpitch softball. For whatever reason I can't get any to grow to that size, even with aggressive pruning. Maybe it was because of the fertilizers my dad would use that I prefer not to. I've also realized that I'm really the only person in my household that will eat tomatoes by themselves so I limit it to just one plant now. The rest are roma tomatoes for making tomato sauce or cherry tomatoes for salads. Also, facebook reminded me today that I did battle with a tomato hornworm 4 or 5 years ago. I apparently was victorious. Hate those buggers. Juliet (https://www.totallytomato.com/P/00400/J ... rid+Tomato). These are kinda directly between cherry and paste tomatoes. The only thing I don't like about these is I can't save seed, as they're F1 hybrids. Costoluto Genovese (https://www.totallytomato.com/P/00203/C ... ese+Tomato) This one is best for a sunny spot, although it does not need the crazy amount of heat needed for most tomatoes it's size like a beefsteak or carbon. Pretty much anything from this guy: (https://wildboarfarms.com/) who creates localized seedlines for north bay climates via open pollination. Of note that have done well for me are Sungold, Sweet Tooth, Boar's Tooth, and Secret Sauce (tall). I like the idea of buying from someone who is creating their own hybrids locally. You know you're getting something that will do well for your climate. I've talked to a few guys here that tend to have larger growing operations (to the point where I wonder if they are on the local police radar for how much electricity they draw in the winter getting their seeds growing). I might have to drop them a line again and see how their doing. I grow a lot of stuff in the suburbs, but mostly not edible. I usually grow hot peppers and a bunch of herbs, though. This year, I put a tea plant into the ground — it really hasn’t appreciated the heat, even though it’s in deep shade. I’m suprised it’s not balking at our chalky, alkaline soils though. In terms of more perennial plants, figs and pomegranates do well, but I rarely am able to get any fruit before birds and squirrels do. Ginger has been a winner — it even managed to survive this last winter, which was unusually cold. It literally gets no care whatsoever, and continues to grow. I do have some edible bananas, but they’ve never flowered in time to give me ripe fruit (though it is possible to get the timing right if you use lots of fertilizer). Rosemary grows great, and I’d really like to try growing persimmons too. I used to grow a lot more edible stuff — berries, squash, tomatoes. But it’s a pain. Tomatoes don’t really fruit here much past June because of the heat, berries get decimated by animals and sometimes struggle in full sun, squash are slaughtered by squash vine borers before they get any squash. Artichoke grew pretty well here, and I’ve been able to get good harvests of some winter veggies, but it can be tough. I’m trying to grow some grapefruit, and they’re doing as OK as you can expect them to be. I’ve got some alpine strawberry seeds I want to plant — do any of you have any idea of their cold and heat hardiness? I wouldn’t be surprised if they could make it through our winters, but idk about our summers. pogrmman wrote: I’ve got some alpine strawberry seeds I want to plant — do any of you have any idea of their cold and heat hardiness? I wouldn’t be surprised if they could make it through our winters, but idk about our summers. I've got alpine strawberries planted in all sorts of recesses throughout the garden (it has runners like woah), and the areas it's done best in are in the shade, under the citrus trees. All of the areas in full sun required lots of water and TLC to make sure they didn't dry out and die, and that's in Oakland summer, it sounds like you're somewhere that gets much, much hotter. Grapefruit will likely do great, oranges too. When I lived in San Diego the sun baked everything in summer, but tomatoes did awesome, as long as you chose the right spot (filtered or partial sunlight in the hottest part of the day) and kept them happy with enough water ("water crystals" and mulch help a lot to tide them over between waterings). I know a lot of people grow ordinary strawberries as (fall-spring) annuals here. I’ll try the alpines in some shady spots — see if I get some to live/grow. I guess now is a good time tos tart the seeds, so I can set out plants in the fall! Despite our hot summers, are winters are a tad cold for most citrus. You do see the occasional mature orange, mandarin, or grapefruit, but it’s not all that common. You’ve got to protect them to let them get established, and then in maybe 1/4 of winters after that. That’s why the grapefruit are an experiment! It makes this part of Texas an interesting place to grow stuff — our winters vary a lot, so we need low-chill temperate plants. (Sub)tropicals can grow really well in the summer, but are killed or damaged by the winter cold. The urban heat island helps some with the latter part — you don’t see any citrus outside of the city until about 100 miles south of here, but there are some inside the city. I’ve mostly come about to the conclusion that a separate spring and fall crop is the way to go for a lot of plants here (plus a winter crop of hardy stuff like broccoli). Grapefruits are pretty hearty to the cold (they actually need the cold to color up, tropically grown grapefruits remain green). Satsumas may be your best bet though, as they can survive into the low 20s (F), a filtered sunlight location perhaps, so that they don't fry in summer. Regarding suburban fruit, some of my figs are starting to ripen, and I’m wondering about keeping off birds, squirrels, raccoons, and other vermin. We’ve always had a couple large fig trees, but if they are a variety that colors up as they ripen, we are never able to harvest more than one or two fruit because of the animals. How the heck do you protect them? They already knocked off and ate all of this year’s pomegranates (although they were nowhere near ripe, I found them all on the ground over a period of about a week with bird pecks and/or squirrel bites out of them). I don’t want to lose the non-green figs too! I mean, I do have a fig tree I know the birds won’t get to (green ischia), but my other fig gets delicious, huge fruits (maybe 2x the size of a mission fig) that are mostly all eaten by birds. I put some netting around the first one that’s nearly ripe, but last year, a raccoon got into the netting and ate the figs when I did the same. Squirrels tear apart quite underripe ones, and birds always seem to get them at the moment of perfect ripeness. 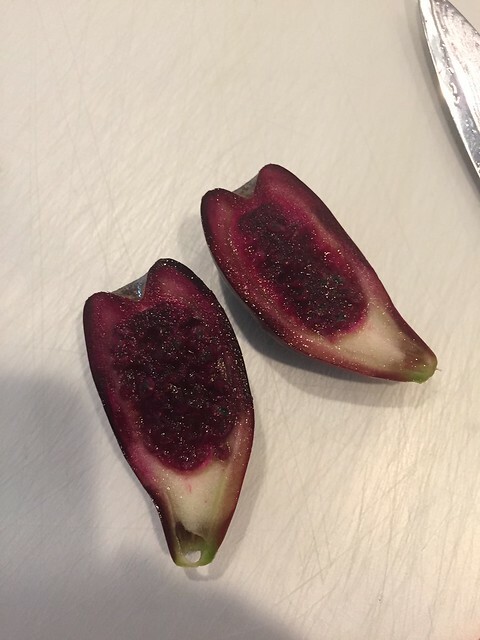 Never mind about that — I was able to pick a wonderful, sweet, fantastic fig this morning. The netting plus waking up early helped. I think the rain this morning did too. You can see how big the thing was. There’s 2 or 3 more that’ll be ripe this week. I don’t actually know the variety — the tree was bought as “brown turkey”, but the leaves look wrong. Whatever it is, it grows fantastically here. That's awesome, I love figs. This weekend we found we definitely have a couple of squashes growing on our giant squash plant. They're not ripe yet, but it's exciting! Also used basil from the yard for a pesto. That's a nice looking fig. We have a very fruitful pomegranate tree that appears to be fairly safe from the local birds - this year I harvested all the fruit, ended up with about 50 nice pomegranates. Had to give most of them away, I never got around to making molasses like I planned. But we have tiny squashes now! Our garden is a bit of a mess right now, but we've got a few very large blueberry bushes, tomatoes, lots of herb plants, asparagus, strawberries (which have spread all over), some years we do squash. Years ago, I dig up a small, wild prickly pear (the species is Opuntia engelmannii var. lindheimeri) and transplanted it. It’s grown into a big sprawling plant, and I finally got around to trying it’s fruit today. It doesn’t have the same flavor as most of the prickly pears I’ve had before, but it’s got a wonderfully complex, sweet flavor (albeit fairly mild). It was a tad underripe, but still great. Because it’s wild, the seeds are very hard and the fruit is covered in many sharp, tiny, barbed spines called glochids. But, the plant is trivially easy to grow and the glochids keep the fruit safe from animals and can be burned off. I’m glad to have this plant in my garden. -3 different types of chillies (1 pequino, 2 unidentified), 2 of these are indoors the rest are outside cause the summer's been extra warm. -Tomatoes. I had the police on my door a few years ago cause someone reported them as "suspicious plants" and I was growing around 8 plants. Only got one this year, these haven't been too successful, I can get about 4-6 tomatoes per plant through the season around here, which I don't quite think justify the effort. -Carrots. Grown in milk-cartoons. First year I'm growing them, looking good. -Sugar-peas. Quick to grow, very efficient, but the summer has been a bit too warm for them. -Spring onions. Indoors during winter, outside during summer. -Salads, various kinds. The first batch I planted never started growing. Nor did the second. But the third is coming along nicely. Haven't done anything different though so don't quite know what what made the difference. Might have been the heat. I've also grown bell peppers previous years, but they were a bit too much of a hassle. I want to grow more types of onions and garlic, but I'm not quite sure how to most cost-efficiently approach them. I'm also moving soonish so I'll have to see if I can even set up a new growth system for the next season. I'll be moving north of the polar circle so I need to figure out what plants can deal with the climate well. We've been getting some great cucumbers and a couple of acorn squashes (and more on the way). Also our first zucchini! The tomatoes don't look ripe yet, but maybe soon. We've been getting loads of beets from our CSA and we'll have to figure out what to do with those.